only at ExhibitDEAL offers a wide variety of portable podiums and tables for trade shows, in-store promotions, corporate events or sales meetings. Our counters offer convenient shelving and lockable storage. 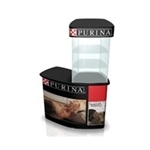 Combining versatility and customization to meet all your needs, these make for a great demo station, service kiosk or welcome booth. Additionally, they are the simple and quickest product to assemble. Demonstration stations to sample products, showcase services or provide customer service. Modular and custom configurations to fit your needs.